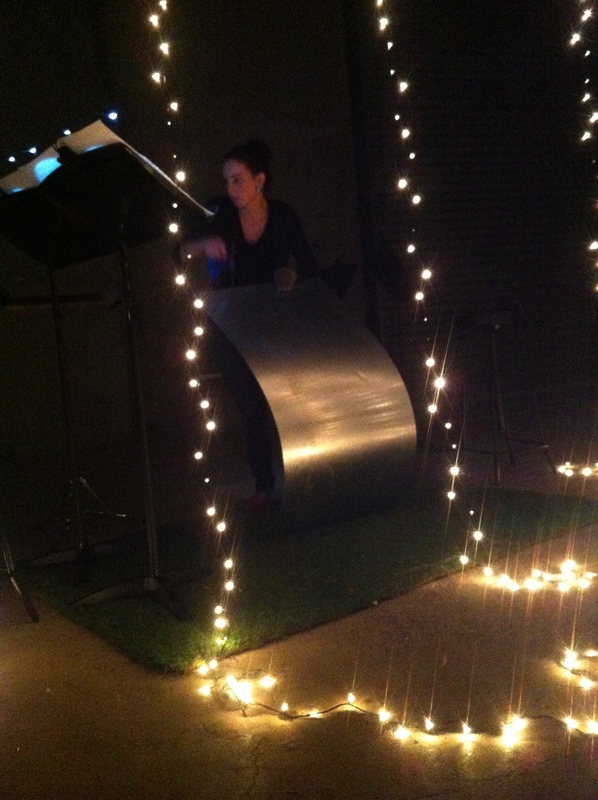 There was a charmed quality to the second concert of Callum G’Froerer’s ANAM fellowship, where solo and small ensemble works for trumpet, violin, voice, double bass and percussion flowed past as seamlessly as the Merri Creek just outside the warehouse venue’s door. The carefully-curated and -staged programme gave rise to a rarefied sound world of delicate and uncommon extended techniques. More familiar techniques were given new life in the resonant environment by an ensemble of dedicated performers. G’Froerer began the concert with the ominous rising tones of Morton Feldman’s Very Short Trumpet Piece, hidden behind the audience in the offices overlooking the warehouse floor. Instruments at the ready, the double bassists Jon Heilbron and Rohan Dasika stared each other down behind a curtain of fairy lights like a pair of dueling mythical creatures. This cinematic superposition gave way to Rebecca Saunders’ Blue and Gray, where the double bassists sprang to life with groaning crescendi. The gritty, grinding attacks echoed around the room as the beasts of wood battled. Eres Holz’s MACH for solo trumpet set a new tempo for the space alternating rapid, mincing steps and short lyrical flights. A parrot also took flight outside, briefly adding its squawking counterpoint to Holz’s mysterious calculations, by then obscured behind a trumpet mute. G’Froerer’s deft manipulation of the first valve slide in the third section of the piece left all the trumpet-players breathless and the rest of the audience confused and impressed by the timbral spectrum opening up before them. The most remarkable moment of the concert was also its quietest: Helmut Lachenmann’s Toccatina for solo violin, performed with casual precision by Amy Brookman. The piece is true to its name, deriving from the Italian toccare “to touch,” in the diminutive. Brookman lightly touched the screw of the bow to the violin strings, bringing out pinpoints of sound with this subtlest of articulations. This technique developed into a sort of double pizzicato with the screw passing back and forth past the string. Once the note was released, the screw rejoined the string with the wiry jangling of a guitar-slide. This dynamic climax of the piece was followed by toneless bowing on different parts of the instrument and rapid ricochets with the back of the tip of the bow near the bridge. Brookman’ performance was a frank statement of what can be achieved before one even reaches mezzo-piano. Abel Paúl’s Wrong Answers to Robert B’s Wrong Question continued the investigation into novel instrumental techniques, this time focusing on a single sheet of metal. Fingers, a tuning fork, a hacksaw and finally the ubiquitous superball mallet were all brought to bear on the clanging, springing, singing piece of metal. The piece has no interest past its catalogue of eyebrow-raising techniques, which are each carefully displayed like exotic artefacts in a museum by the gloved performer (Kaylie Melville). Covering stage changes, short pieces by Feldman and Carter descended upon the audience from the offices above the audience. Of note was Jenny Barnes’ rendition of Feldman’s Only for solo voice. Barnes’ tone is unlike any other emerging singer in Melbourne, combining an untrained-sounding simplicity with technical precision and a flair for improvisation and timbral exploration. This voice came to the fore in an improvised set at the end of the concert, where G’Froerer, Heilbron, Barnes and electronics artist Jon Smeathers deployed their precise and innovative musical craftsmanship in an utterly transporting musical soundscape.